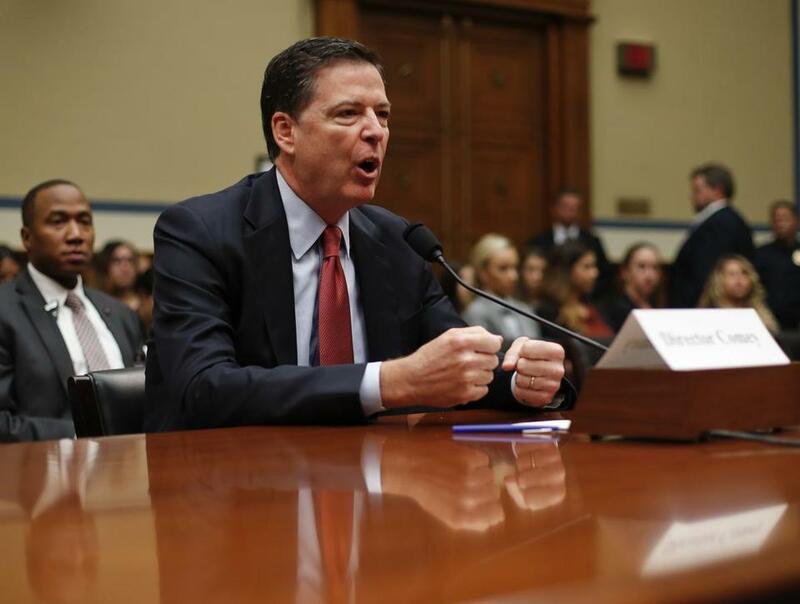 FBI Director James Comey testified on Capitol Hill on Sept. 28. So here’s my abbreviated look back on the year that was. The biggest political story of 2016 is of course the election of Donald Trump. It’s a story that I — and many others — got spectacularly wrong. But the decisive moment of the 2016 campaign — the one that got Donald Trump elected president — was FBI Director Jim Comey’s Oct. 28 letter to Congress about the investigation of Hillary Clinton’s private e-mail server. In an election in which Clinton lost the Electoral College by 80,000 votes in three states (but won the popular vote by nearly 3 million) there can be numerous explanations for why she lost. She didn’t spend enough time in swing states and relied too much on “big data.” She spent too much time demonizing Trump and not enough reaching out to angry and economically anxious white working-class voters. Jill Stein and Gary Johnson took votes away and Bernie Sanders depressed progressive Democratic turnout. There’s something to each of these, but they’re not quite adequate. Sure, she could have spent more time in Michigan and Wisconsin, but she still would have lost because she didn’t win in the swing states in which she did actively campaign. A lot of Trump voters reported feeling economically anxious, and yet Clinton did better among those who said the economy was their number one issue. If every Stein voter had cast a ballot for Clinton, she likely would have won, but it’s not clear that every Stein voter would have done that if Stein hadn’t been on the ballot. In the end, it was Clinton’s job to energize Democrats, no matter what Sanders or Stein had said about her. But even in the places where she did mobilize them (like Pennsylvania and Florida), Trump mobilized them more. Others will argue that Clinton was the victim of harsh media coverage, particularly of the WikiLeaks data dump. It’s true, but this is not a satisfactory or easily quantifiable explanation. Racism and misogyny strike me as more convincing reasons, but it’s hard to prove that Trump’s politically incorrect appeals drove his support or that all his supporters are racists and misogynists. What we can say — and should say loudly — is that Trump voters were not bothered nearly enough by his racism and misogyny. With Comey, however, though the evidence is not definitive, it’s pretty darn close. According to Nate Silver, Clinton’s national lead dropped from 5.7 percent on Oct. 28 (the day of the Comey letter) to 2.9 percent a week later. She won the popular vote by 2.1 percent. There might be another explanation for why Clinton’s support dropped in half on the last week of the campaign. But as a wise man once said, sometimes a cigar is just a cigar. The impact of the Comey letter didn’t just materialize on Oct. 28. It began with Comey’s decision in July not to seek criminal prosecution for Clinton’s use of a private e-mail server, but yet to publicly characterize her actions in prejudicial terms, such as “extremely careless.” This charge was dubious at best, but it also wasn’t his place to make such comments. In doing, so he furthered a narrative pushed by Donald Trump and picked up by the mainstream media that Clinton had done something fundamentally wrong by using a private e-mail server. For more than three months she was able to outrun this sentiment, but the October letter brought it all back to the fore. Now one can certainly argue that Clinton shouldn’t have had a private e-mail server or that Bill Clinton shouldn’t have met with Attorney General Loretta Lynch on that tarmac in Arizona. They can say that the race never should have been that close. But this is a dodge. Comey violated long-standing Department of Justice practice; he was warned not to send his letter at the time and yet acted anyway — and the impact is measurable. This is a hard conclusion to swallow. It puts a perennial black cloud over Trump’s presidency — and indeed democracy in America — by suggesting a nonpartisan law enforcement agency put its thumb on the scale to help him win. It points a finger at the media for how they covered the e-mail story — and takes away responsibility from Clinton for her loss. It indicts voters for choosing a manifestly unqualified candidate over the most qualified presidential candidate in modern American history, because she had a private e-mail server. But the numbers don’t lie. At the end of the day, Comey, more than any other American, helped ensure Trump’s win. That is, and always will be, on him.